The concept behind this newsletter is that anyone with 15 minutes to spare can learn about the work of SATuRN. 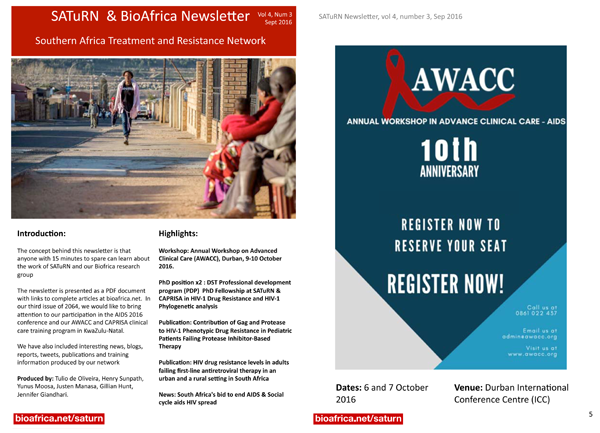 In this third 2016 issue of our newsletter we have included interesting news, blogs, reports, tweets, publications and training information produced by our network. We hope you enjoy it and find it informative. We welcome any feedback about content or format. - News: South Africa's bid to end AIDS & The cycle of infection in South Africa, Science 2016 coverage of our phylogenetics results.